Paul Auster's signature work, "The New York Trilogy," consists of three interlocking novels: "City of Glass," "Ghosts," and "The Locked Room" - haunting and mysterious tales that move at the breathless pace of a thriller. "City of Glass" - As a result of a strange phone call in the middle of the night, Quinn, a writer of detective stories, becomes enmeshed in a case more puzzling than any he might hace written"Ghosts"Blue, a student of Brown, has been hired to spy on Black. From a window of a rented house on Orange street, Blue stalks his subject, who is staring out of "his" window. "The Locked Room" - Fanshawe has disappeared, leaving behind his wife and baby and a cache of novels, plays, and poems. What happened? Features an introduction from Luc Sante and incredible cover illustrations by Pulitzer Prize-winning graphic artist Art Spiegelman, creator of "Maus "and "In the Shadow of No Towers". 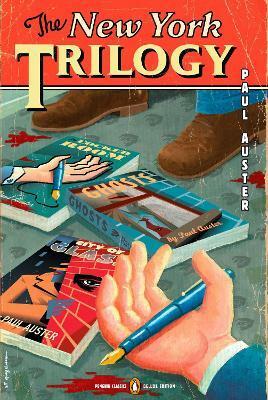 Praise for The New York Trilogy: "Eminently readable and mysterious. . .Auster has added some new dimensions to modern literature, and - more importantly even - to our perspectives on our planet." "Exhilarating. . .a brilliant investigation of the storyteller's art guided by a writer who's never satisfied with just the facts." "Auster harnesses the inquiring spirit any reader brings to a mystery, redirecting it from the grubby search for a wrongdoer to the more rarified search for self." Paul Auster is the bestselling author of The New York Trilogy and many other critically acclaimed novels. He was awarded the Prince of Asturias Prize in 2006. His work has been translated into more than forty languages. He lives in Brooklyn, New York. Luc Sante teaches writing and the history of photography at Bard College. His books include Low Life, Evidence, and The Factory of Facts. Art Spiegelman is a cartoonist who first came to attention in the early 1980s as editor of the magazine Raw. His books include the Pulitzer Prize-winning Holocaust story Maus, Maus II, and In the Shadow of No Towers. He lives in New York City with his wife and two children.